This past summer, Won’t You Be My Neighbor, the bio-documentary tribute to Fred Rogers, received wide acclaim and continues to be a deep well of thoughtful commentary. As one of many voicing their praise for the documentary, I run the risk of sounding like a broken record. But I also know the tune of grace never grows old, and few sing it better than Fred Rogers. Won’t You Be My Neighbor takes a look at the production of PBS’s television show Mr. Rogers’ Neighborhood, and documents the life of the late TV icon, Fred Rogers. 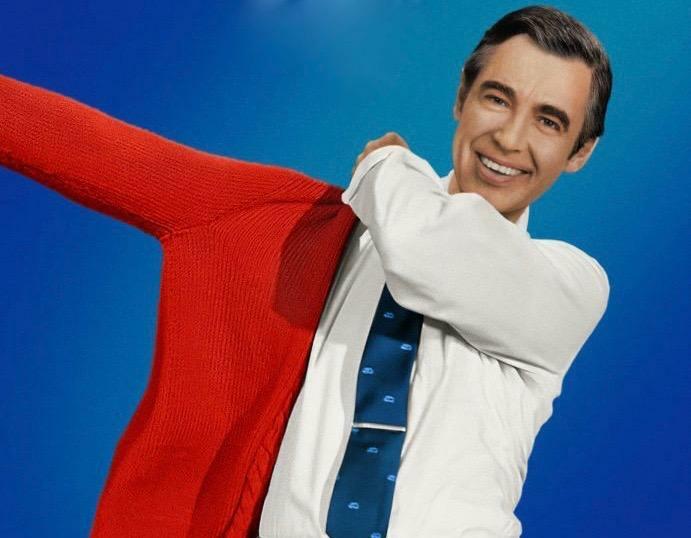 In the film, director Morgan Neville honestly portrays the development, mission, and success of Mr. Rogers’ television show and uses personal accounts, family stories, and live footage to show viewers how special Fred Rogers really was. The documentary is shot with the same winsomeness in which the show was created, the pacing a tangible ode to the deliberate cadence of Fred Rogers. Much of the acclaimed film doubles as a remedy to the soul – each one of the Fred Rogers stories a unique band-aid for particular wounds. The most moving scenes are usually the simplest as you quickly realize that Rogers’ songs, interactions, and conversations with his audience of children also speak to the deep needs in all of us. In one particular scene, Fred attempts to convince the Senate for public television funding. Against all odds, he persuades the sub-committee by singing them a song about dealing with anger. A song for children deeply moves the head of the sub-committee – a Senator who had previously turned all other requests aside – to grant the 20 million dollars of funding to Fred’s show. In another scene, Fred drops an anvil of simple wisdom concerning people’s motivations: “Love is at the root of everything: all learning, all relationships. Love, or the lack of it.” And while my gratitude for Fred Rogers runs deep, it feels disingenuous. When I was eight years old, Mr. Rogers was the last thing I wanted to watch. Give me Spider-Man or give me death. I didn’t want a kind grandpa telling me I was special, I wanted Wolverine and as many sneak peaks of MTV as possible. Land of Make Believe? No thanks. Puppets? I’d rather have Transformers. And yet when I didn’t flip through PBS fast enough, the old man in the cardigan would capture my gaze. His appeal entirely opposite of what I was looking for but wholly necessary for what I needed. In no small way, he drew me into stillness by his posture alone despite my reluctance. His conversation seemingly tailored to me, a 30-minute sabbath in the middle of the day. Twenty years later, Wolverine has moved to the big screen for our viewing pleasure, but in tow is Mr. Rogers with a documentary as simple as his show. In the age of blockbusters and bonafide action franchises, a film has been made about a man who spoke simply to children, who slowed their pace and held their gaze. It’s a story of a man who deliberately refused to create mindless content; a man who broke down race barriers in the 70s by washing a black man’s feet on national television, who wasn’t afraid to talk about suicide and divorce with children, a man who started a kitchen timer to demonstrate how long a minute was as he (awkwardly) sat in silence for 60 seconds. The film humanizes Rogers and reveals more layers to the man than the show let on. The director does well to show that some puppet personalities in The Land of Make Believe were expressions of Rogers’ own doubts and childhood insecurities. But the humanization of Rogers also shows that he was simpler and kinder than the show let on. For those only privy to the 30-minute episodes of Mr. Rogers, the documentary reveals Rogers is as delightful off-screen as he is on. When he’s not playing with puppets in the Land of Make Believe, he’s bantering with the crew, making goofy faces offset, and devoting every fiber of his being to making those around him feel loved and heard. Those that knew Fred Rogers best knew his television persona was no act. But that wasn’t the case for everyone. People questioned his sexuality because of his winsome and jovial posture. His kindness was exploited through late night TV bits and demeaning sketches. In the film, we learn that the rumors about Rogers being a tattooed navy seal – a myth I too believed – are false. Chalk it up to our human tendency to place people in boxes. When an enigma like Fred Rogers doesn’t fit in a certain box, we conjure up ones we think he goes in: below his cheery demeanor, there must be a dark and complex past. But what the film reveals is that Mr. Rogers was authentically human; delightfully and wonderfully made. Kind and slow and consistent. He showed a type of love that caused people to scratch their heads and fabricate stories just to make sense of him but in so doing, missed him entirely. Poet Mary Karr writes, “The voice of God is small & fond & local.” I think that Mr. Rogers heard that voice. I think he was so familiar with it that the voice of God shaped his own. Fred Rogers weighed 143 pounds for the last 30 years of his life. It was a weight he diligently maintained until the day he died in 2003. 143 is shorthand for “I love you” – the numbers signifying the number of letters in each of those three powerful words. Fred Rogers quite literally embodied love. We’ll never know if Fred Rogers’ quirky weight reminded him more to love others or that he himself was loved. I think if we could ask him which one it was, he’d smile and consider the question like it was the most important question in the world. And after a careful and deliberate pause, I think he’d look us in the eyes and say that it was both.